Another post about the life of Charlotte Brontë from Luv Lubker – to whom I am indebted for such painstaking research. Wonderful tales of a little proposition made by George Smith to Charlotte…if you have missed her first post about the relationship between the author of Jane Eyre and her publisher, you might like to read the first part here. Charlotte Bronte’s favorite author besides Thackeray was Sir Walter Scott, the author of Ivanhoe, Rob Roy, and Lady of the Lake. At the end of her London visit in 1850, she wrote to her best friend that George had invited her to come to Edinburgh and Melrose with him (with his brother and sister). She thought he was joking at first and refused, and his mother did not approve. “Mrs. Smith did not favour it; you may easily fancy how she helped me to sustain my opposition, but her son only waxed more determined. “His mother is master of the house, but he is master of his mother. This morning she came and entreated me to go. “George wished it so much”; he had begged her to use her influence, etc., etc. Now I believe that George and I understand each other very well, and respect each other very sincerely. We both know the wide breach time has made between us; we do not embarrass each other, or very rarely; my six or eight years of seniority, to say nothing of lack of all pretension to beauty, etc., are a perfect safeguard. I should not in the least fear to go with him to China. Abbotsford had been Sir Walter Scott’s home. It is beautiful – it has sculptured stones from other castles and abbeys built into it and a 9,000 volume library. “Though the time was brief, and the view of objects limited, I found such a charm of situation, association, and circumstances that I think the enjoyment experienced in that little space equaled in degree and excelled in kind all which London yielded during a month’s sojourn. “The six weeks of change and enjoyment are past, but they are not lost; memory took a sketch of each as it went by, and, especially, a distinct daguerreotype of the two days I spent in Scotland. Those were two very pleasant days. I always liked Scotland as an idea, but now, as a reality, I like it far better; it furnished me with some hours as happy almost as any I ever spent. 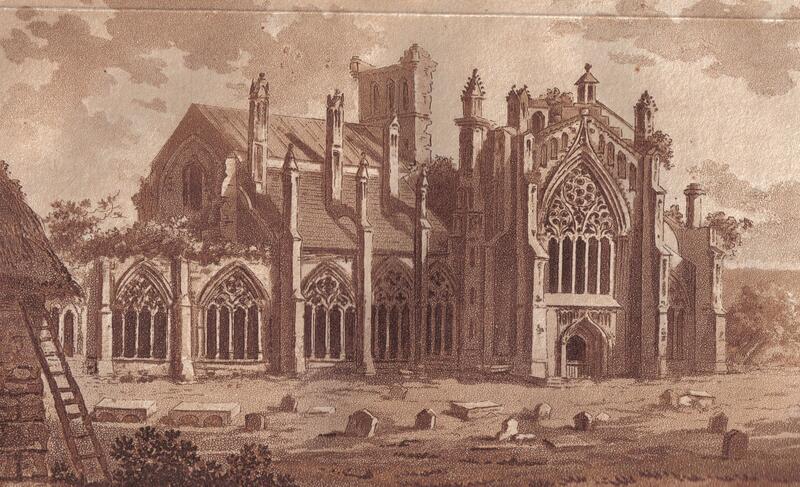 Melrose Abbey is about 3 miles from Abbotsford. It is the setting of The Lay of the Last Minstrel, which Charlotte said was her favorite poem. Posted in Literary livesTagged Charlotte Bronte, George Smith, Melrose AbbeyBookmark the permalink. Renews my interest in a trip to Scotland . . . I always liked Scotland as an idea, but now, as a reality, I like it far better; it furnished me with some hours as happy almost as any I ever spent. How I would love to see this place. Tappity-tapping for more of Charlotte and George! I will eagerly await the next part! Her descriptive language is fascinating and very beautiful! You can hear how much this trip meant to her. Very special! I felt sad reading her words about how she and George were separated by her six or eight years of seniority and lack of beauty.